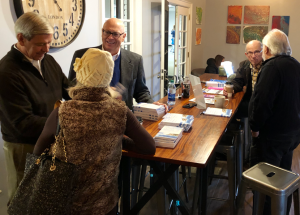 In early December, we held the first book signing for “The Greatest Church in the World” a book that has been an idea in my head for a couple of years. 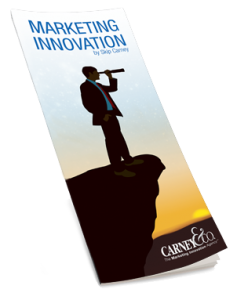 Now, the idea is tangible and shareable. 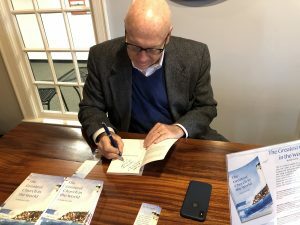 I thoroughly enjoyed discussing the book and signing 34 copies. But the deeper reward was sharing the book’s message with members of the local community. “The Greatest Church in the World” is the parable of a young pastor who has failed at two churches and is ready to quit the ministry. Three hundred and forty-seven miles from home, he turns in to a small town. There, he meets a pastor and a community that teach him the principles of church success. He learns these principles from different members of the community – the mayor, a young married couple, the pastor. Community is an integral theme in the book, and it is also proving integral to the book’s success. How does a new author launch his passion project? He lays the foundation in his community first. I wanted the book to impact as many hearts and churches as possible at its initial launch. 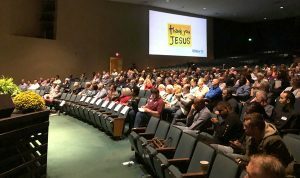 The ReNew18 Pastors Conference proved the perfect event to do just that. Sharing this book with nearly 300 pastors and non-profit ministries was powerful. I was thankful to do this before jumping into my presentation. The most rewarding part is this event happened in my backyard, at North Carolina Wesleyan College in Rocky Mount, NC. “The Greatest Church in the World” is spreading through Rocky Mount and expanding its reach across city and state lines. It is available on Amazon, a platform with international shipping. However, it is also available at many local businesses, such as The Bath Place, Almand’s Drug Store (Westridge location) and Morning Addiction Coffee House. The intimate setting of the local coffee shop made the event feel especially communal. I was surprised and pleased with the number of folks who came out to the signing. There were old friends and folks I had never met until that day. It was a great experience and we also had a chance to support a local business, Trax Coffee Bar, which hosted the event. As this book grows in influence and its principles spread throughout the country, I will not forget its grassroots foundation. Thank you to the Rocky Mount community for giving this project wings. For up-to-date information on book events, visit facebook.com/skipcarneyauthor. Skip recently spoke at the ReNew 18 Pastors Conference at NC Wesleyan College on Oct 18th. Many pastors from all across NC came out to enjoy great speakers such as Thom Rainer and others. Looking forward to next year’s event.